Billy Herron is the “new” author The Advertiser is introducing, his stories start this week. 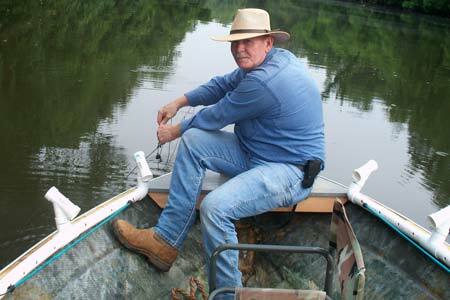 He really isn’t new in that readers, both enjoyed a series of Steven’s Creek fishing expeditions along with biological studies of the mud cats in that creek last spring – all from his pen. Not a biologist per se, Billy is someone who has spent most of his young life (and he is still somewhat young, certainly more so than his photographs portray) on that creek, so much so that he has true expertise from experience. Readers will enjoy this new subject, the motorhome; Herron had many adventures in motorhomes of more than one type, and the reader will follow him over the United States as he enjoys the road. The reader will learn how he came to fix an old motorhome, the problems with warranties, the will it takes to keep such second-hand machines going, the fun for him and his partner on the “hi-way” as he calls it, and the dangers that are always there in driving a big truck or pulling a motorhome cross country. This story is full of adventure, interesting mishaps and ongoing passion that its author holds for many things, travel on the “hi-way” being the main one here. The story, possibly an autobiographical novelette, that is coming to you serially, is written in Herron’s personal style. Editing has been done to help the reader’s understanding, but much of his language has been left to show the spontaneity of prose as he meets with huge disappointments and challenges. There are long sentences that give a feel of the plodding on the road, and plenty of technical terminology when those big machines he drives need fixing! Not much more needs to be said about Herron, for his story is about his life, and as the reader comes to know Mr. Herron in this series, there will be a wish to know more about his adventures – and more may be coming, in time, with stories again of fishing on Stevens Creek in the late spring.